Abstract: It is widely recognised by hearing aid users and audiologists that a period of acclimatization and adjustment is needed for new hearing aid users to become accustomed to newly fitted hearing aids. I will present a summary of our research into acclimatization which includes i) investigation of real life, perceptual and electrophysiological changes with hearing aid use, ii) new users’ reports of the experience of ‘getting used to’ hearing aids and iii) the hypothesis that adjustment to hearing aids involves a process of learning to ‘tune out’ unwanted and distracting background sounds that may impact on speech recognition. Understanding of acclimatization to hearing aids could inform how and when hearing aid benefit should be assessed and could also help people obtain with hearing impairment more benefit from amplification. 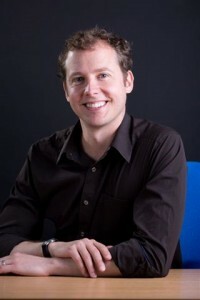 Bio: Piers studied speech and hearing science at undergraduate level in Australia. He moved to the UK to study for a DPhil in experimental psychology at Oxford University. He is a lecturer in audiology at the University of Manchester and co-lead of the European SENSE-Cog study on sensory impairment and mental well-being in older adults. Piers’ research interests include the epidemiology of hearing loss, hearing genetics, treatments for hearing loss including hearing aid uptake and benefit, and the impact of hearing loss and auditory processing impairments on development and quality of life in childhood and old age. Piers was awarded the British Society of Audiology’s Thomas Simm Littler Prize for his work on the epidemiology of hearing loss and acclimatization to hearing aids. Registration: Entry is free and open to the public. Please email louise.dodd@mq.edu.au to register by 26 May 2016.